Tsum Tsum squishies are small collectible toys that feature all of your favourite Disney characters in a compact, collectible form. You can stack 'em, roll 'em and indeed squish 'em! Lara is very much into collectibles at present - she has just turned 7 and is always on the lookout for little trinkets for her bedroom that she can show off to her friends. Series 1 of the Tsum Tsum (pronounced zoom zoom, apparently!) is already available and features animals and friendly faces from Disney animations new and old. Lara was very taken by these little characters who are all recognisable (even though they're highly stylised). Each set of Tsum Tsum squishes comes with a collector's checklist so you can see the other characters in the range and tick them off as you collect them. In series 1 there are 50 characters to collect, including several ultra rare golden characters including Elsa and Mickey himself! As you'd expect from the Disney name, Tsum Tsum toys are better quality than any other similar small collectors items currently targeted at kids. They're made by Zuru - home of Robo-Fish and Go-Go Bubbles. 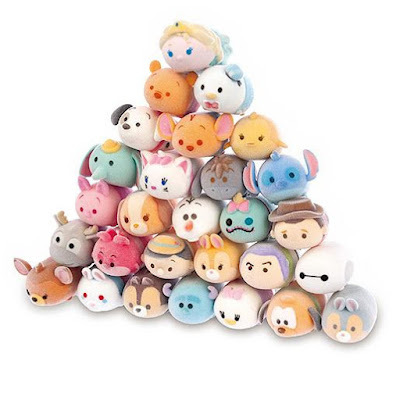 Disney Tsum Tsum squishies come in packs of 2,4 and 5, each with a mystery character hidden inside which adds to the suspense of collecting them (and of course, the risk of buying one you already own). Tsum Tsum even come with their own app but we haven't tried it yet. Fans of Disney Tsum Tsum will be pleased to know that this month series 2 of these collectible characters will be released. A whole new set of Tsum Tsum characters but this time with a flocked, slightly fluffy coating to make them extra specially cute! With packs from £2.99 I expect Lara to be saving her pennies and looking out for these sets of Tsum Tsum Series 2 squishies in Argos and Tesco when we pop in over the summer. You will also find them in Debenhams, Asda, Toys R Us, Smyths, Morrisons and The Entertainer. They make great gifts for Disney fans (young or old) and would be lovely little additions to a party bag.